The Mushrooms stand tall here in Mushroom Land. With their red hats on they sparkle with happiness. They always keeps guard in the forest. No intruders can pass them, so only kind creatures dance in the morning mist. Wee Christmas spirits, toys, softies, elves, creative gals and other fairy tale creatures with wings… On occasion also the snowman. 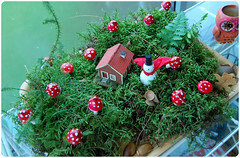 He is so polite that he is always welcome to Mushroom Land, especially in December! Everyone needs a hug in December. 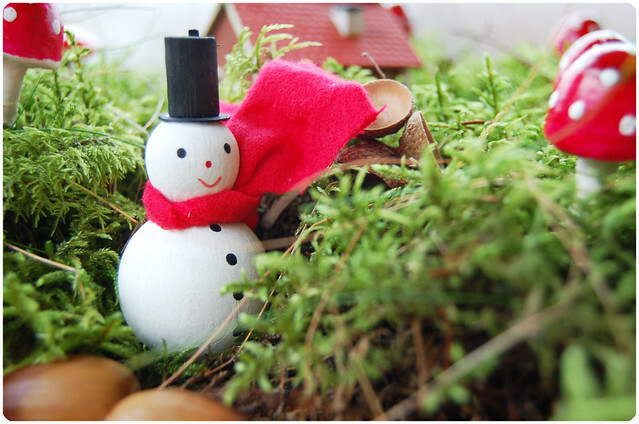 It had been snowing so the snowman kind of glided in, visiting in the forest, bringing his cheerful kind way. He was like a promise of better days, of wrapped gifts and family gatherings around the fire. Everyone wanted to hug him, but by morning all the snow melted and reveled the Mushrooms again. Mr. Snowman agreed to stay a while though, at least until Christmas, because he felt at home in the forest. Who wouldn’t? What it this all about you ask? It’s my pretend place, all shiny and new but oh, so tiny. It’s created with this week’s Flea market finds and a bit of moss put together on a tray, and there you go. Served with December Feelings and a hint of Crafty Magic. 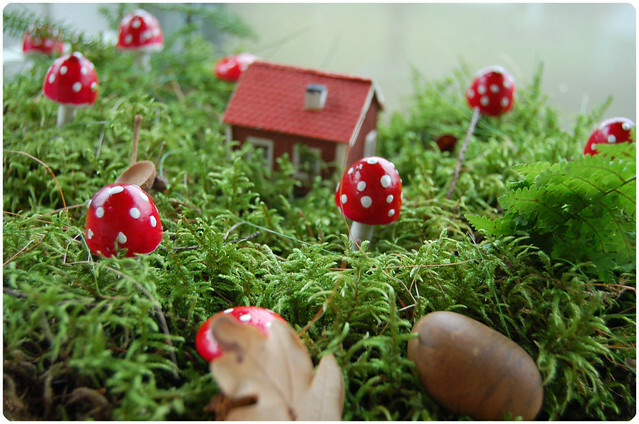 The house you can spot in the middle of Mushroom Land came in a box of lots of little houses. I bought it for my dad’s Tiny World, the little Alp Town with Märklin trains (but I’m borrowing it for now). It is plastic and made in Germany, we think it’s 1950-ish. The red mushrooms came in a bouquet from the huge table with Christmas ornaments at the thrift shop, and so did the wooden snowman. Can you smell the forest? 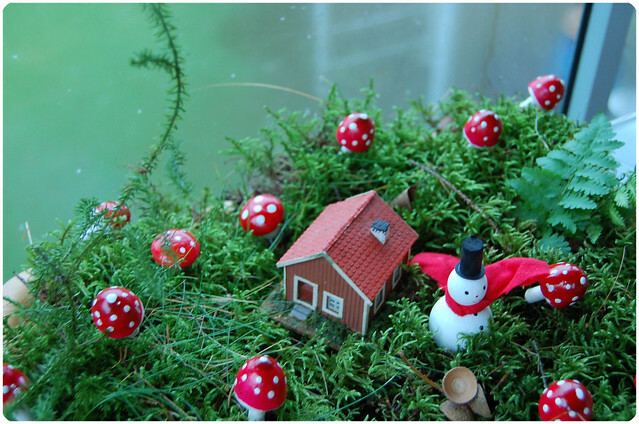 This entry was posted in Photography and tagged christmas craft, imagination, miniature, snowman, storytelling. Bookmark the permalink. Som du vet så gillar jag din blogg så du har fått en utmärkelse! 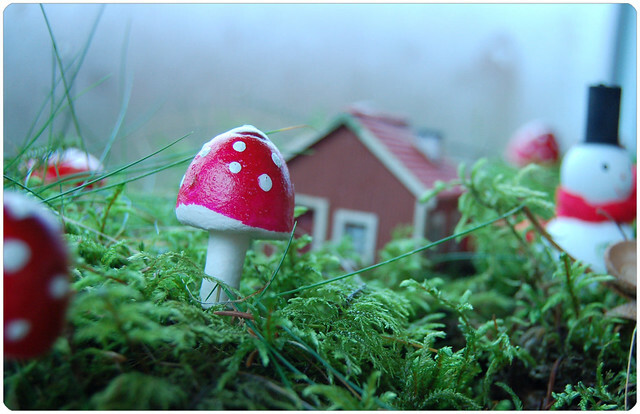 I love mushroom land :o) what a charming place! I love Mushroom land, too. If I was a little girl, I would spend hours there myself. So cute! 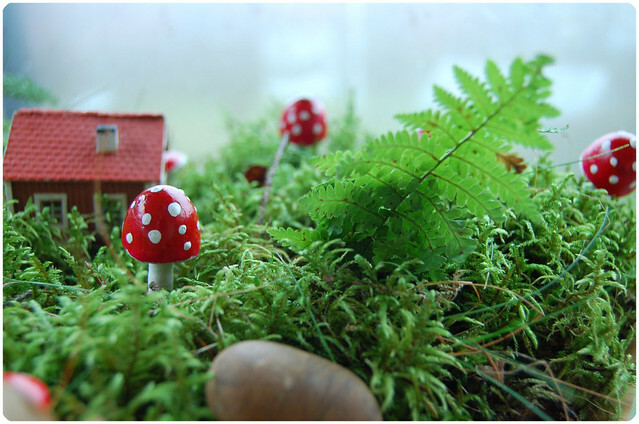 I would love to live in Mushroom Land. I wish I could find cute ornaments at my thrift shop….it is always so picked over by the time I get there. Maybe I need to start going at the crack of dawn. I made my mushroom comment in the below blog entry. Do know how I did that but I did. was young. He got it at a school Santa Shop. God Bless You and Yours and Merry Christmas!!! I love the Mushroom Forest ! I can smell the sweet smells of moss under foot and the pine sap in the air. What a magical place to visit ! Wheeee! It’s so cute! Happy holidays Hanna! can you email me at littledipper.com? Wow. You really made it so realistic we could smell it, but not so realistic that its not filled with fantasy, too. I love that little flickr set. Shiny mushrooms and friendly. I am liking making theatres and dioramas and scenes. I hope to make more. This one is really cool, Hanna! Oh, my goodness. This is the most wonderful, lovable thing I’ve seen in a while. I want to live there, too! S? fint st?lle du har skapat med den r?da stugan och sn?gubben. F?r att inte tala om svamparna!!! Precis s? h?r gjorde jag n?r jag var liten. Byggde upp milj?er, varf?r g?r jag inte det nu??!! Du ?r s? inspirerande! I wish I could live in Mushroom Land. Very magical and lovely. Mushroom Manis! Vilken smurfig k?nsla.